The Earl of Warwick reported from the Lords Committees to whom the Bill, intituled, "An Act for enlarging the Term and Powers granted by an Act passed in the First Year of the Reign of His present Majesty, intituled, An Act for repairing the Road from The Powder Mills, on Hounslow Heath, in the County of Middlesex, to a Place called Basingstone, near the Town of Bagshot, in the Parish of Windlesham, in the County of Surrey," was committed: "That they had considered the said Bill, and examined the Allegations thereof, which they found to be true; and that the Committee had gone through the Bill, and directed him to report the same to the House, without any Amendment." St. Catherine Coleman Church, Bill. The Lord Bishop of St. Asaph made the like Report from the Committee to whom the Bill, intituled, "An Act to enable the Parishioners of the Parish of Saint Catherine Coleman, in Fenchurch Street, in the City of London, to re-build the Church of the said Parish," was committed. 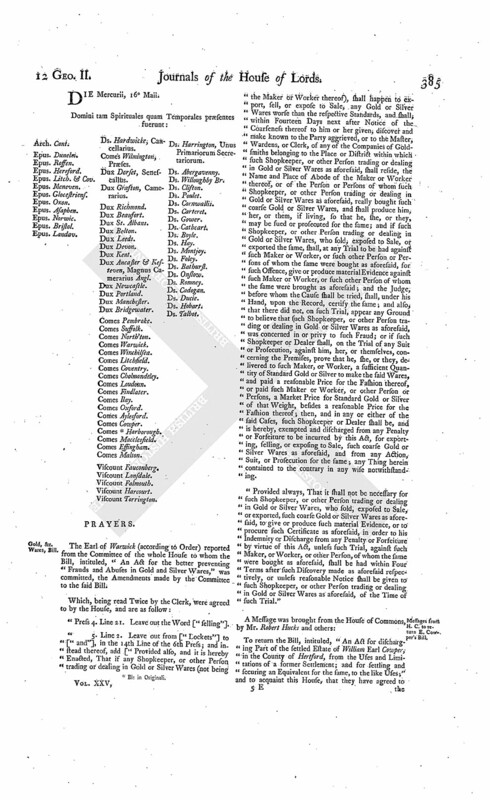 Ordered, That the Cause wherein Robert Geddes of Scotstoun Esquire is Appellant, and James Earl of Roseberry and others are Respondents, which stands for an Hearing this Day, be put off to Wednesday next; and the Cause which stands to be heard on Monday next, to the Friday following; and the other Causes removed in Course, except the Cause wherein John Roche and William Mahony Esquires are Appellants, and Robert Warren Esquire is Respondent, which stands to be heard peremptorily on Monday Sevennight. Hodie 2a vice lecta est Billa, intituled, "An Act for establishing and well-governing an Hospital, or Infirmary, in the City of Bath,"
Viscount Torrington. L. Ap. Cant. L. Bp. Bristol. L. Harrington, Sec. Annuities on the King's Children, Bill. 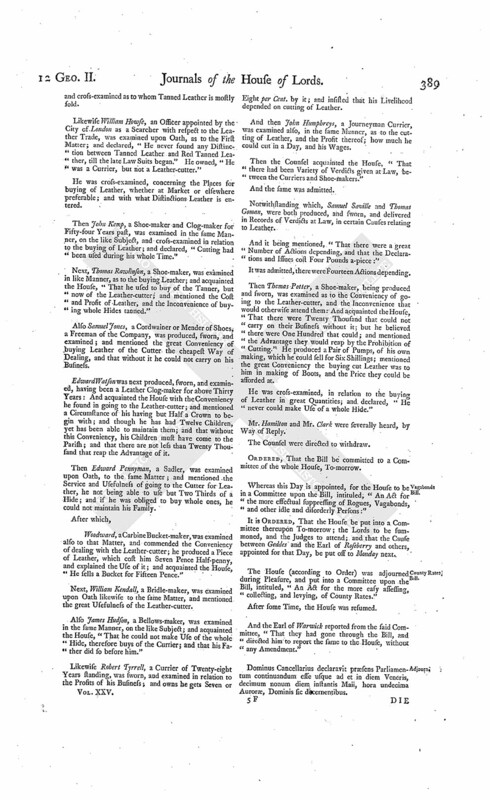 With a Bill, intituled, "An Act to enable His Majesty to settle an Annuity of Fifteen Thousand Pounds on his Royal Highness the Duke of Cumberland and the Heirs of his Body; and also One other Annuity of Twenty-four Thousand Pounds on their Royal Highnesses the Princess Amalie and Princess Caroline, the Princess Mary, and the Princess Louisa;" to which they desire the Concurrence of this House. Ordered, That the same be read a Second Time, on Monday next. Message from H. C. to return Langdale's Bill. To return the Bill, intituled, "An Act for Sale of Part of the Estate of Jordan Langdale Esquire, in the County of York, for Payment of Debts and Encumbrances affecting the same;" and to acquaint this House, that they have agreed to the same, without any Amendment. Ordered, That the House be now put into a Committee, to take the said Message and Treaty into Consideration; and that the same be referred to the said Committee. Accordingly, the House was adjourned during Pleasure, and put into a Committee thereupon. Address upon it to be drawn. "That an humble Address be presented to His Majesty, to express our dutiful and grateful Sense of His Royal Care and Attention for the Peace and Welfare of these Kingdoms; and for preserving the Public Tranquillity, and the Balance of Power in Europe. "To return His Majesty the Thanks of this House, for having concluded a Treaty of Defensive Alliance with the King of Denmark, and for having ordered the same to be laid before us: And to assure His Majesty of the Support and Concurrence of this House, in making good the Engagements which He hath thereby entered into; and to give His Majesty the strongest Assurances, that this House will zealously and chearfully support Him, in making such further Augmentation of His Forces, either by Sea or Land, as may become absolutely necessary, by reason of any Emergency arising from the present Posture of Affairs in Europe, which may nearly concern the Honour, Interest, and Safety, of these Kingdoms; and in concerting such Measures as the Exigency of Affairs may require." It was proposed, "To agree with the Committee in the said Resolution." Their Lordships, or any Five of them; to meet immediately, at the usual Place; and to adjourn as they please. And the Duke of Newcastle reported from the said Committee, an Address drawn by them. "We, Your Majesty's most dutiful and loyal Subjects, the Lords Spiritual and Temporal in Parliament assembled, beg Leave to express the grateful Sense we have of Your Majesty's Royal Care and Attention for the Peace and Welfare of these Kingdoms, and for preserving the Public Tranquillity and the Balance of Power in Europe. "At the same Time, permit us to return Your Majesty our humble Thanks, for having concluded a Treaty of defensive Alliance with the King of Denmark; and for having ordered the same to be laid before us; and to assure Your Majesty of our Concurrence and Support, in making good the Engagements which you have thereby entered into. "We also beseech Your Majesty to accept the strongest Assurances, that we will zealously and chearfully support Your Majesty, in making such further Augmentation of Your Forces, either by Sea or Land, as may become absolutely necessary, by reason of any Emergency arising from the present Posture of Affairs in Europe, which may nearly concern the Honour, Interest, and Safety, of these Kingdoms; and in concerting such Measures as the Exigency of Affairs may require." Witnesses to attend Insolvent Debtors Bill. Ordered, That Robert Martin, Richard Chandler, John Stubbin, Edward Seaborn, John Spells, Robert Kitching, James Scott, John Stebbing, and Philip Gilbert, do attend this House on Tuesday next, to be examined, as Witnesses on Behalf of the Bill to explain and amend the Act in relation to Insolvent Debtors. Dominus Cancellarius declaravit præsens Parliamentum continuandum esse usque ad et in diem Sabbati, duodecimum diem instantis Maii, hora undecima Auroræ, Dominis sic decernentibus. His Majesty to be attended with the Address. The Lord Steward acquainted the House, "That the Lords with White Staves had (according to Order) waited upon His Majesty, humbly to know what Time He would be pleased to appoint to be attended by this House, with their Address; and that His Majesty had been pleased to appoint this Day, at Two a Clock, at His Palace of St. James's." Hodie 3a vice lecta est Billa, intituled, "An Act to enable the Parishioners of the Parish of Saint Catherine Coleman, in Fenchurch Street, in the City of London, to re-build the Church of the said Parish." Hodie 3a vice lecta est Billa, intituled, "An Act for enlarging the Term and Powers granted by an Act passed in the First Year of the Reign of His present Majesty, intituled, An Act for repairing the Road from The Powder Mills on Hounslow Heath, in the County of Middlesex, to a Place called Basingstone, near the Town of Bagshot, in the Parish of Windlesham, in the County of Surrey." The Earl of Findlater (pursuant to the Order of this House on Thursday last) presented to their Lordships a Bill, intituled, "An Act for naturalizing John Deshons." The House being informed, "That Mr. Patrick Keaghran attended, in order to deliver in several Papers, Pleadings, and Proceedings, in the Cause wherein Gerald Burke Esquire is Appellant, and Sir Walter Blake Baronet Respondent:"
And then be was directed to withdraw. Brereton to enter into Recognizance for Westby. The House being moved, "That Richard Brereton may be permitted to enter into a Recognizance for William Westby Esquire, on account of his Appeal depending in this House; he being in Ireland:"
It is Ordered, That the said Richard Brereton may enter into a Recognizance for the Appellant, as desired. Dominus Cancellarius declaravit præsens Parliamentum continuandum esse usque ad et in diem Lunæ, decimum quartum diem instantis Maii, hora undecima Auroræ, Dominis sic decernentibus. "I take this Address as a real Mark of your Zeal and Affection for My Person and Government. You may depend upon it, that the Confidence which you repose in Me shall be made Use of with the strictest Regard to the true Interests of My People." Ordered, That His Majesty's most Gracious Message to this House on Thursday last, the Address of this House to His Majesty thereupon, and His Majesty's most Gracious Answer to the said Address, be forthwith printed and published. Hodie 2a vice lecta est Billa, intituled, "An Act to enable His Majesty to settle an Annuity of Fifteen Thousand Pounds on His Royal Highness the Duke of Cumberland and the Heirs of his Body; and also One other Annuity of Twenty-four Thousand Pounds on their Royal Highnesses the Princess Amalie, the Princess Caroline, the Princess Mary, and the Princess Lovisa." Moved, "That the said Bill be now read a Third Time." The Question was put, "Whether the said Bill shall be now read the Third Time?" Then the Bill was accordingly read the Third Time. John Deshons took the Oaths appointed, in order to his Naturalization. Hodie 2a vice lecta est Billa, intituled, "An Act for naturalizing John Deshons." 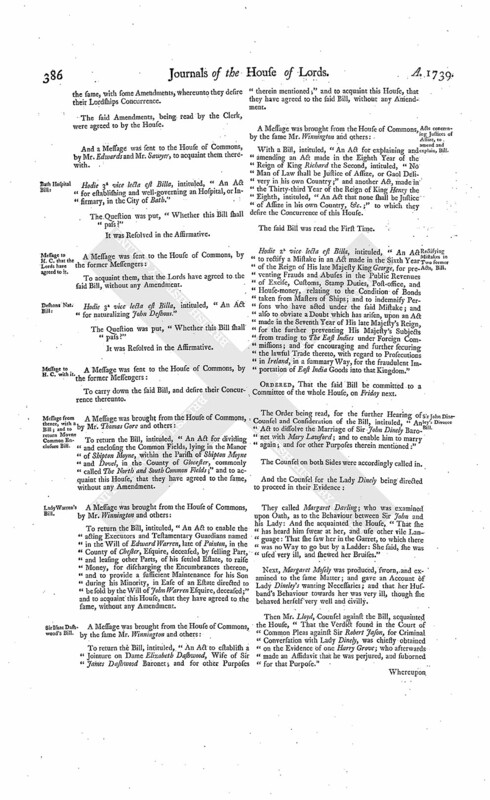 Sir J. Dinely's Divorce, Bill. 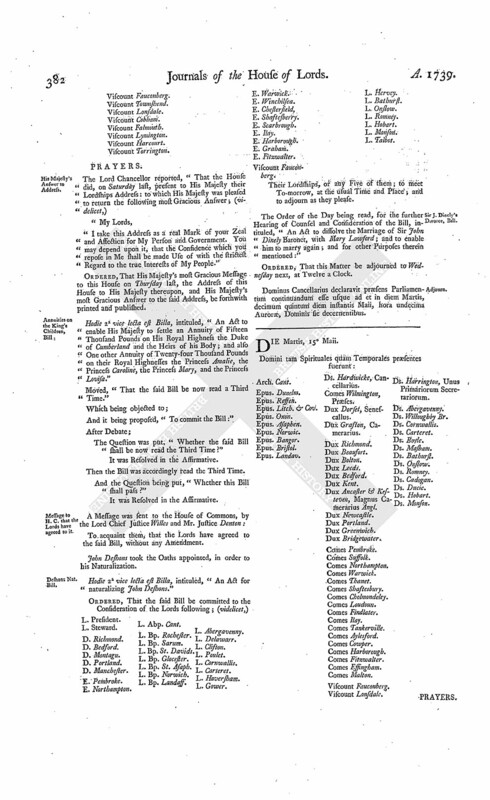 The Order of the Day being read, for the further Hearing of Counsel and Consideration of the Bill, intituled, "An Act to dissolve the Marriage of Sir John Dinely Baronet, with Mary Lawford; and to enable him to marry again; and for other Purposes therein mentioned:"
Ordered, That this Matter be adjourned to Wednesday next, at Twelve a Clock. Dominus Cancellarius declaravit præsens Parliamentum continuandum esse usque ad et in diem Martis, decimum quintum diem instantis Maii, hora undecima Auroræ, Dominis sic decernentibus. Bp. of Oxford to preach 29th Instant. Ordered, That the Lord Bishop of Oxford be, and he is hereby, desired to preach before this House, in the Abbey Church, Westminster, on Tuesday the 29th Day of this Instant May, being the Anniversary Thanksgiving to Almighty God, for the Restitution of King Charles the Second and Royal Family, and the Restoration of the Government. Mistakes in Two former Acts to rectify, Bill. With a Bill, intituled, "An Act to rectify a Mistake in an Act, made in the Sixth Year of the Reign of His late Majesty King George, for preventing Frauds and Abuses in the Public Revenues of Excise, Customs, Stamp Duties, Post-office, and House-money, relating to the Condition of Bonds taken from Masters of Ships; and to indemnify Persons who have acted under the said Mistake; and also to obviate a Doubt which has arisen, upon an Act made in the Seventh Year of His said late Majesty's Reign, for the further preventing His Majesty's Subjects from trading to The East Indies under Foreign Commissions; and for encouraging and further securing the lawful Trade thereto, with regard to Prosecutions in Ireland, in a summary Way, for the fraudulent Importation of East India Goods into that Kingdom;" to which they desire the Concurrence of this House. The Earl of Findlater reported from the Lords Committees to whom the Bill, intituled, "An Act for establishing and well-governing an Hospital, or Infirmary, in the City of Bath," was committed: "That they had considered the said Bill, and examined the Allegations thereof, which they found to be true; and that the Committee had gone through the Bill, and directed him to report the same to the House, without any Amendment." His Lordship made the like Report from the Committee to whom the Bill, intituled, "An Act for naturalizing John Deshons," was committed. Ordered, That the last mentioned Bill be engrossed. 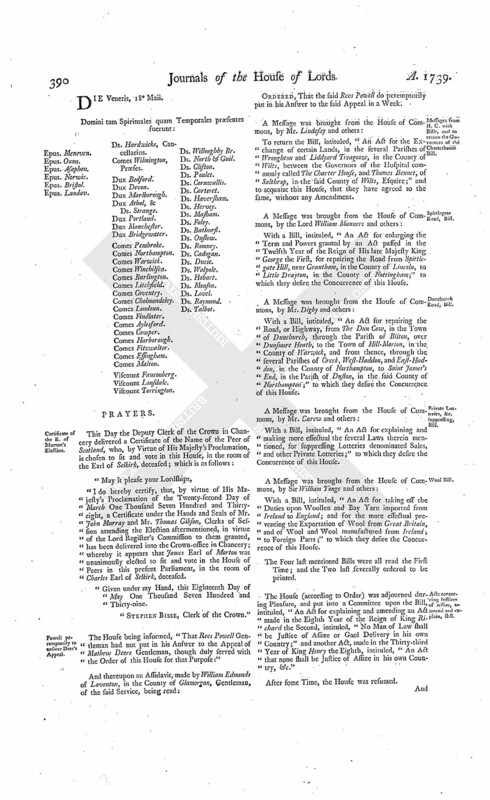 A Petition of Abigail Birmingham and others, was presented, and read; setting forth, "That the Petitioners were admitted, by the Court of Exchequer in Ireland, to sue as Paupers, none of them being worth Five Pounds in any Worldly Substance;" and praying, "That they may be admitted to prosecute their Appeal depending in this House in Forma Pauperis; and that Mr. Fazakerley and Mr. Murray may be assigned for their Counsel, and Mr. Sharp for their Solicitor." Ordered, That the Petitioners be admitted to prosecute their said Appeal in Forma Pauperis, as desired; and that Mr. Fazakerley and Mr. Murray be assigned for their Counsel, and Mr. Sharp for their Solicitor. Ashworth also admitted in Forma Pauperis. A Petition of William Ashworth, was read; praying, In regard he is unable, by reason of his Poverty, to speed his Appeal depending in this House, not being worth Five Pounds in any Worldly Substance, that he may be admitted to prosecute the same in Forma Pauperis; and that Mr. Murray and Mr. Crook may be assigned for his Counsel." Ordered, That the Petitioner be admitted to prosecute his said Appeal in Forma Pauperis; and that Mr. Murray and Mr. Crook be assigned for his Counsel, as desired. Account of Rum, Sugar, &c. imported in America, from the British Sugar Islands. He was called in; and delivered, at the Bar, "An Account, with the Return of the Commissioners of the Customs." "An Account of what Quantity of Rum or Spirits, Molasses, Sirups, Sugar, or Paneles, have been imported into any of His Majesty's Northern Colonies in America, from any of the British Sugar Islands, from Christmas 1727, to Christmas 1737; distinguishing each Year, and each Colony and Island:"
"We herewith humbly lay before you, by the Hand of our Secretary, an Account of the Quantity of Rum, Molasses, and Sugar, imported into His Majesty's Northern Colonies in America, from any of the British Sugar Islands, for Seven Years, Part of the Time required by the said Order; distinguishing each Colony, and each Island: And we beg Leave to acquaint your Lordships, that, not having in this Office any Books, or Returns, from whence the rest of the Accounts required can be drawn out, we have given Orders to the proper Officers in the said Colonies to transmit them forthwith to this Board. Ordered, That the said Return, and Accounts therewith delivered, do lie on the Table. The House (according to Order) was adjourned during Pleasure, and put into a Committee, to consider further of the Bill, intituled, "An Act for the better preventing Frauds and Abuses in Gold and Silver Wares." Whereas To-morrow is appointed, for the House to be in a Committee upon the Bill, intituled, "An Act for the more effectual punishing and suppressing of Rogues, Vagabonds, and other idle and disorderly Persons:"
Ordered, That the House be put into a Committee thereupon, on Thursday next; the Lords to be summoned; and the Judges to attend. Ordered, That the said Hearing be put off to Friday next; and the Cause for that Day to the Wednesday following; and all the other Causes after that, appointed to be heard peremptorily on Monday next, be removed in Course. 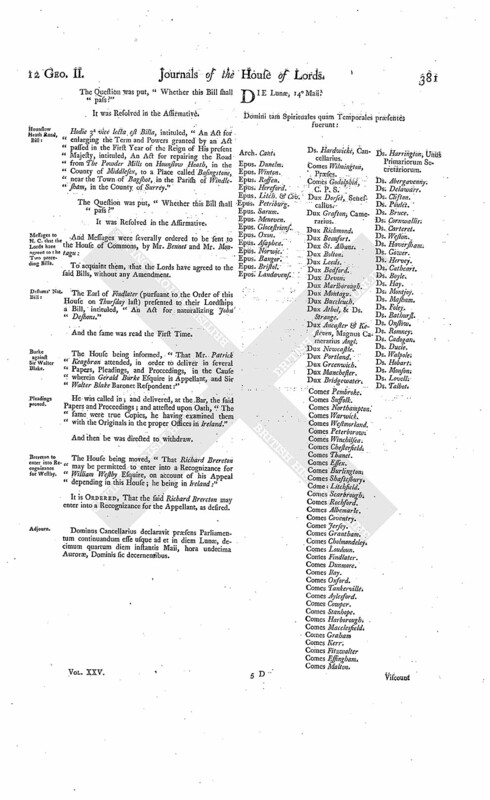 The Order being read, for the further Hearing of Counsel and Consideration of the Bill, intituled, "An Act to obviate some Doubts which have arisen, upon the Construction of an Act, made in the First Year of the Reign of King William and Queen Mary, intituled, "An Act for explaining Part of an Act, made in the First Year of the Reign of King James the First concerning Tanned Leather;" and for rendering more effectual a Clause in the said last mentioned Act, which obliges Curriers to curry Leather:"
They called John Rowe, a Shoemaker; who was examined upon Oath, in relation to the Method of serving or supplying the Shoemakers with Leather; and produced Pieces of Leather untouched by the Currier, and explained the Uses they were fit to be put to; and endeavoured to make it appear, that the Shoemakers might be supplied with Leather without the Assistance of the Curriers; and gave an Account of the great Profit made by them in cutting of Leather. Next, William Baston, a Tanner, of Lempster, in Herefordshire, was produced, sworn, and examined, in relation to the supplying the Shoemakers with Leather; and as to the Practice of Leather-cutting by the Curriers, how long it has been in Use; and other Matters. Then Henry Mountague, of Pall-Mall, a Woman's Shoemaker, was examined upon Oath, as to the buying of Leather; and whether better to go for it to Market, or to buy of the Curriers. Also John Cadwell, a Man's Shoemaker, examined in like Manner, in relation to the buying of Leather; and whether better to go to the Tanner or the Currier. Robert Hinton, a Journeyman Woman's Shoemaker, examined likewise upon Oath, in relation to the supplying the Shoemaker with Leather; how he may best procure it; and as to the Usefulness of Tanners. Likewise Richard Harkinstall, another Journeyman Shoemaker, was examined in the same Manner, how the Shoemakers are supplied with Leather, and by whom, and in relation to their Wages. Then Israel Atwell, a Cobler, was also examined upon Oath, as to the supplying of Leather; and whether better by the Tanner or Currier; and in relation to the Profit made by the latter. Likewise Samuel Randal, a Leather Clog-maker, examined in like Manner, touching the Leather most fit for his Use, and by whom he could be cheapest and best supplied. After which, Timothy Beaston, a Sadler, was also examined upon Oath, as to the Leather fittest for his Business; and how, he could be best and cheapest supplied. Next, Robert Careless, a Bellows-maker, was examined in the same Manner, how he can be best supplied with Leather, and by whom; whether at Market, or by the Leather Cutters. Also, Joseph Cook, a Collar-maker, examined in the like Manner, where he would choose to buy Leather: And acquainted the House, "He had been refused at Market, and bid go to the Curriers." Then William Newsome, an Engine-maker, was examined in the same Manner, whether better to buy of the Tanner or Currier. After which, William Ambrose, a Currier, examined also upon Oath, as to the currying of Leather; and whether Sole Leather is capable of being curried or not. John Johnson, from the Excise-office, to give the House an Accompt of the Amount of the Drawback on unmanufactured as well as manufactured Leather, and how entered. Then Francis Russell, a Soldier, but bred a Shoemaker, was examined likewise upon Oath, as to Leather sent from hence to Jamaica; in what Manner, and for what Uses; how manufactured; and as to the Difference between our Leather and theirs. And then Samuel Vanassell, a Worker-on of all Stuff, was examined in the same Manner, as to the Quantity of Leather used in the making a Pair of Shoes, and how much the Wages paid to a Journeyman. After which, Mr. Lloyd and Mr. Murray were severally heard, for the Bill. Ordered, That the further Hearing of Counsel and Consideration of the said Bill be adjourned to Thursday next, at Twelve a Clock. Dominus Cancellarius declaravit præsens Parliamentum continuandum esse usque ad et in diem Mercurii, decimum sextum diem instantis Maii, hora undecima Auroræ, Dominis sic decernentibus. The Earl of Warwick (according to Order) reported from the Committee of the whole House to whom the Bill, intituled, "An Act for the better preventing Frauds and Abuses in Gold and Silver Wares," was committed, the Amendments made by the Committee to the said Bill. "Press 4. Line 21. Leave out the Word ["selling"]. "5. Line 2. Leave out from ["Lockets"] to ["and"], in the 14th Line of the 6th Press; and instead thereof, add ["Provided also, and it is hereby Enacted, That if any Shopkeeper, or other Person trading or dealing in Gold or Silver Wares (not being the Maker or Worker thereof), shall happen to export, sell, or expose to Sale, any Gold or Silver Wares worse than the respective Standards, and shall, within Fourteen Days next after Notice of the Coarseness thereof to him or her given, discover and make known to the Party aggrieved, or to the Master, Wardens, or Clerk, of any of the Companies of Goldsmiths belonging to the Place or District within which such Shopkeeper, or other Person trading or dealing in Gold or Silver Wares as aforesaid, shall reside, the Name and Place of Abode of the Maker or Worker thereof, or of the Person or Persons of whom such Shopkeeper, or other Person trading or dealing in Gold or Silver Wares as aforesaid, really bought such coarse Gold or Silver Wares, and shall produce him, her, or them, if living, so that he, she, or they, may be sued or prosecuted for the same; and if such Shopkeeper, or other Person trading or dealing in Gold or Silver Wares, who sold, exposed to Sale, or exported the same, shall, at any Trial to be had against such Maker or Worker, or such other Person or Persons of whom the same were bought as aforesaid, for such Offence, give or produce material Evidence against such Maker or Worker, or such other Person of whom the same were brought as aforesaid; and the Judge, before whom the Cause shall be tried, shall, under his Hand, upon the Record, certify the same; and also, that there did not, on such Trial, appear any Ground to believe that such Shopkeeper, or other Person trading or dealing in Gold or Silver Wares as aforesaid, was concerned in or privy to such Fraud; or if such Shopkeeper or Dealer shall, on the Trial of any Suit or Prosecution, against him, her, or themselves, concerning the Premises, prove that he, she, or they, delivered to such Maker, or Worker, a sufficient Quantity of Standard Gold or Silver to make the said Wares, and paid a reasonable Price for the Fashion thereof, or paid such Maker or Worker, or other Person or Persons, a Market Price for Standard Gold or Silver of that Weight, besides a reasonable Price for the Fashion thereof; then, and in any or either of the said Cases, such Shopkeeper or Dealer shall be, and is hereby, exempted and discharged from any Penalty or Forfeiture to be incurred by this Act, for exporting, selling, or exposing to Sale, such coarse Gold or Silver Wares as aforesaid, and from any Action, Suit, or Prosecution for the same; any Thing herein contained to the contrary in any wife notwithstanding. "Provided always, That it shall not be necessary for such Shopkeeper, or other Person trading or dealing in Gold or Silver Wares, who sold, exposed to Sale, or exported, such coarse Gold or Silver Wares as aforesaid, to give or produce such material Evidence, or to procure such Certificate as aforesaid, in order to his Indemnity or Discharge from any Penalty or Forfeiture by virtue of this Act, unless such Trial, against such Maker, or Worker, or other Person, of whom the same were bought as aforesaid, shall be had within Four Terms after such Discovery made as aforesaid respectively, or unless reasonable Notice shall be given to such Shopkeeper, or other Person trading or dealing in Gold or Silver Wares as aforesaid, of the Time of such Trial." Messages from H. C. to return E. Cowper's Bill. To return the Bill, intituled, "An Act for discharging Part of the settled Estate of William Earl Cowper, in the County of Hertford, from the Uses and Limitations of a former Settlement; and for settling and securing an Equivalent for the same, to the like Uses;" and to acquaint this House, that they have agreed to the same, with some Amendments, whereunto they desire their Lordships Concurrence. The said Amendments, being read by the Clerk, were agreed to by the House. And a Message was sent to the House of Commons, by Mr. Edwards and Mr. Sawyer, to acquaint them therewith. Hodie 3a vice lecta est Billa, intituled, "An Act for establishing and well-governing an Hospital, or Infirmary, in the City of Bath." Hodie 3a vice lecta est Billa, intituled, "An Act for naturalizing John Deshons." Message from thence, with a Bill; and to return Movne Common Enclosure Bill. To return the Bill, intituled, "An Act for dividing and enclosing the Common Fields, lying in the Manor of Shipton Moyne, within the Parish of Shipton Moyne and Dovel, in the County of Glocester, commonly called The North and South Common Fields;" and to acquaint this House, that they have agreed to the same, without any Amendment. To return the Bill, intituled, "An Act to enable the acting Executors and Testamentary Guardians named in the Will of Edward Warren, late of Pointon, in the County of Chester, Esquire, deceased, by selling Part, and leasing other Parts, of his settled Estate, to raise Money, for discharging the Encumbrances thereon, and to provide a sufficient Maintenance for his Son during his Minority, in Ease of an Estate directed to be sold by the Will of John Warren Esquire, deceased;" and to acquaint this House, that they have agreed to the same, without any Amendment. To return the Bill, intituled, "An Act to establish a Jointure on Dame Elizabeth Dashwood, Wife of Sir James Dashwood Baronet; and for other Purposes therein mentioned;" and to acquaint this House, that they have agreed to the said Bill, without any Amendment. Acts concerning Justices of Assize, to amend and explain, Bill. With a Bill, intituled, "An Act for explaining and amending an Act made in the Eighth Year of the Reign of King Richard the Second, intituled, "No Man of Law shall be Justice of Assize, or Gaol Delivery in his own Country;" and another Act, made in the Thirty-third Year of the Reign of King Henry the Eighth, intituled, "An Act that none shall be Justice of Assize in his own Country, &c.;" to which they desire the Concurrence of this House. Rectifying Mistakes in Two former Acts, Bill. Hodie 2a vice lecta est Billa, intituled, "An Act to rectify a Mistake in an Act made in the Sixth Year of the Reign of His late Majesty King George, for preventing Frauds and Abuses in the Public Revenues of Excise, Customs, Stamp Duties, Post-office, and House-money, relating to the Condition of Bonds taken from Masters of Ships; and to indemnify Persons who have acted under the said Mistake; and also to obviate a Doubt which has arisen, upon an Act made in the Seventh Year of His late Majesty's Reign, for the further preventing His Majesty's Subjects from trading to The East Indies under Foreign Commissions; and for encouraging and further securing the lawful Trade thereto, with regard to Prosecutions in Ireland, in a summary Way, for the fraudulent Importation of East India Goods into that Kingdom." 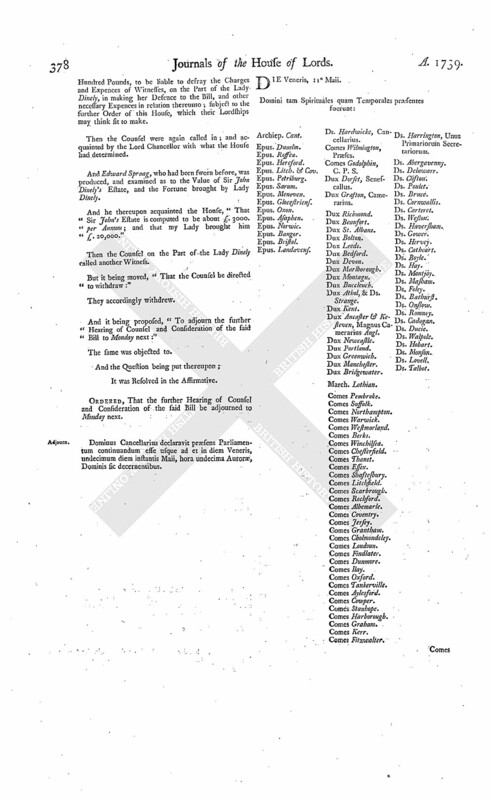 Sir John Dineley's Divorce Bill. 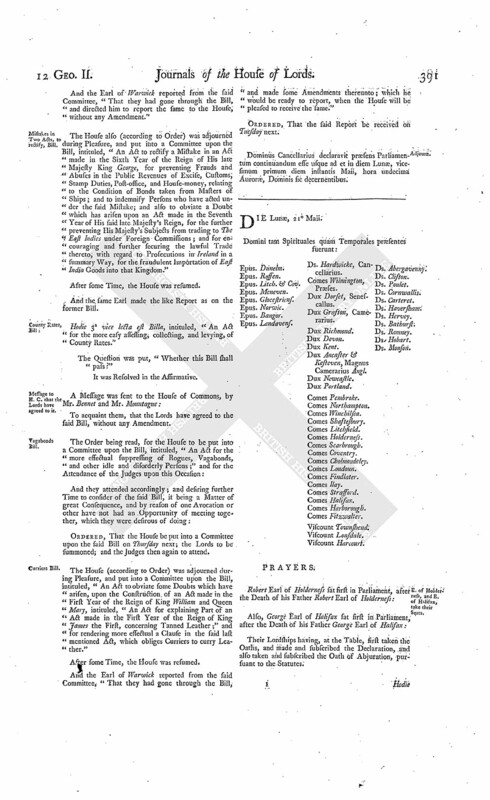 The Order being read, for the further Hearing of Counsel and Consideration of the Bill, intituled, "An Act to dissolve the Marriage of Sir John Dinely Baronet with Mary Lawford; and to enable him to marry again; and for other Purposes therein mentioned:"
The Counsel on both Sides were accordingly called in. They called Margaret Darling; who was examined upon Oath, as to the Behaviour between Sir John and his Lady: And the acquainted the House, "That the has heard him swear at her, and use other vile Language: That she saw her in the Garret, to which there was no Way to go but by a Ladder: She said, she was used very ill, and shewed her Bruises." Next, Margaret Mosely was produced, sworn, and examined to the same Matter; and gave an Account of Lady Dineley's wanting Necessaries; and that her Husband's Behaviour towards her was very ill, though she behaved herself very well and civilly. Then Mr. Lloyd, Counsel against the Bill, acquainted the House, "That the Verdict found in the Court of Common Pleas against Sir Robert Jason, for Criminal Conversation with Lady Dinely, was chiefly obtained on the Evidence of one Harry Grove; who afterwards made an Affidavit that he was perjured, and suborned for that Purpose." Whereupon Edward Spraag was produced, and examined upon Oath, as to the Evidence given by the said Grove at the said Trial; who has since declared, "That he was perjured in giving such Evidence." And being cross examined; he acquainted the House, That the said Grove was the chief Evidence to prove the Fact." Then Thomas Marsham was produced, sworn, and examined as to the said Grove's Confession. And the Counsel against the Bill further acquainted the House, "That the said Grove went voluntarily before Justice De Veil, and made an Affidavit of his being guilty of Perjury." Next, the same Counsel offered to read a Letter, written by the said Grove, confessing his Crime, and signed by him in the Presence of Two Witnesses, One of which was present. Ordered, That the Counsel against the Bill shall not be admitted to give in Evidence the Confession of the said Grove in Writing under his Hand, or the voluntary Affidavit by him made before a Justice of the Peace; both being subsequent to the Verdict obtained by Sir John Dinely against Sir Robert Jason, in order to contradict the Evidence given by the said Grove at the Trial, and to take off the Force of such Verdict. After which, the Counsel for Lady Dinely produced one Thomas Ramell; who, being a Quaker, was examined upon his Affirmation, touching what Fortune Lady Dinely brought her Husband, and as to the Value of his Estate. Next, Nicholas Field was produced, and sworn; but refused to be examined, unless he was satisfied his Charges of his Attendance, which he estimated at about Five Pounds. Whereupon Mr. Chute, of Counsel for Sir John Dinely, acquainted the House, "That his Solicitor believes Sir John will be willing to advance a further Sum, if what is already advanced be not sufficient." Whereupon the said Field was examined as to the Value of Sir John Dinely's Estate; but owned, "That he heard it was encumbered." Then the Counsel for Lady Dinely acquainted the House, "That Sir John had taken out a Commission of Adjuncts, which bears Date 9o Aprilis, 10o Georgii 2di but is not yet executed." And the said Commission was produced. The Counsel for the Bill were severally heard, by Way of Reply. Martha Watkins, Wife of Mr. Watkins the Minister of Sir John Dinely's Parish, was produced, who being sworn, was examined as to Sir John's Method of living, whether plentifully or not, and of his Behaviour towards his Wife; and whether she had or had not Cloaths and Necessaries allowed her; what her Debts amounted to, and what Resentment she expressed against Sir John, if he continued to prosecute her Friends? Next, Edward Spraag was again produced, to give an Account what he had heard the said Minister express of his bad Opinion of Sir John Dinely. And William Dancox was called, and examined, upon Oath, in order to invalidate Spraag's Evidence. Then the Counsel were all directed to withdraw. And it being moved, "To reject the Bill:"
The Question was put, "Whether the said Bill shall be rejected?" Dominus Cancellarius declaravit præsens Parliamentum continuandum esse usque ad et in diem Jovis, decimum septimum diem instantis Maii, hora undecima Auroræ, Dominis sic decernentibus. Acts concerning Justices of Assize to amend and explain, Bill. Hodie 2a vice lecta est Billa, intituled, "An Act for explaining and amending an Act made in the Eighth Year of the Reign of King Richard the Second, intituled, "No Man of Law shall be Justice of Assize or Gaol Delivery in his own Country;" and another Act made in the Thirty-third Year of the Reign of King Henry the Eighth, intituled, "An Act that none shall be Justice of Assize in his own Country." With a Bill, intituled, "An Act for providing a Reward to Joanna Stephens, upon a proper Discovery to be made by her, for the Use of the Public, of the Medicines prepared by her for the Cure of the Stone;" to which they desire the Concurrence of this House. Hodie 3a vice lecta est Billa, intituled, "An Act for the better preventing Frauds and Abuses in Gold and Silver Wares." Ordered, That the Committee to whom the Bill relating to the Repair of the Roads near the City of Bath, and other Purposes, stands committed, be revived; and meet To-morrow. Mahony's Appeal dismissed, upon his Petition. A Petition of William Mahony Esquire, was presented and read; setting forth, "That one John Roche and the Petitioner did, on the 20th of May last, prefer an Appeal to this House, complaining of certain Orders of the Court of Exchequer in Ireland; but that the said Roche is since dead; and the Petitioner, upon a more deliberate Consideration of the Case, is advised to submit to the said Orders, and give the Respondent Robert Warren no further Trouble;" and praying, "That he may have Leave to withdraw the said Appeal; and that the same may be for ever dismissed, and the Orders thereby complained of affirmed." It is Ordered and Adjudged, That the said Petition and Appeal be, and is hereby, dismissed this House; and that the several Orders therein complained of be, and the same are hereby, affirmed. Decree against Powell; a Copy of a Deed to be delivered. A Petition of Mathew Deere Gentleman, was presented, and read; setting forth, "That, on the Second Instant, he exhibited his Appeal to this House, from a Decree of the Great Sessions held before His Majesty's Justices for the several Counties in Wales, to which Rees Powell Gentleman is Respondent; and that the Petitioner applied to the said Justices, for the said Powell's delivering to him a Copy of a certain Deed, which the said Powell had proved in, and read on the Hearing of, the Cause; whereupon the said Justices made an Order, that he should (upon being paid Five Shillings in Court), deliver to the Petitioner a Copy of such Deed in a Fortnight; notwithstanding which, the said Powell refuses to deliver such Copy as by the said Order is directed; and in regard the Petitioner is advised that the said Deed will be absolutely necessary for his preparing his Case against his Appeal comes to be heard, that this House will enforce the said Order, or make such other Order as to their Lordships in their great Wisdom shall seem meet." Ordered, That the Respondent do deliver, or cause to be delivered, to the Appellant, or his Agent, a Copy of the Deed directed to be given him by Order of the said Justices, in the Petition mentioned. 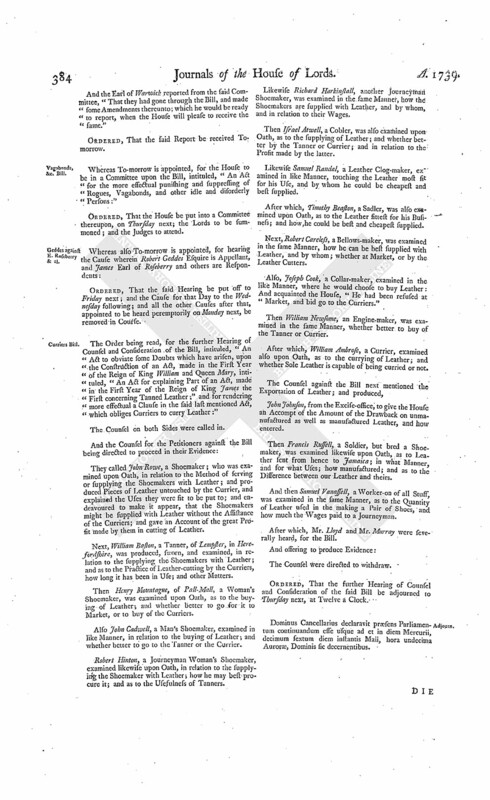 The Order being read, for the further Hearing of Counsel, and Consideration of the Bill, intituled, "An Act to obviate some Doubts which have arisen, upon the Construction of an Act, made in the First Year of the Reign of King William and Queen Mary, intituled, An Act for explaining Part of an Act, made in the First Year of the Reign of King James the First, concerning Tanned Leather; and for rendering more effectual a Clause in the said last mentioned Act, which obliges Curriers to curry Leather:"
And those for the Bill being directed to proceed in their Evidence. They called, and produced, James Parker, a Tanner; who was examined upon Oath, whether there was any Distinction between Tanned Leather and Red Tanned Leather; and as to the Practice of cutting Leather: And he acquainted the House, "He knew of no Difference between them; and that there were Leather-cutters Forty or Fifty Years ago." He was then cross-examined, as to the Difference in Tanning of Leather, and who buys the greatest Quantity. Next, William Langton, another Tanner, was produced, sworn, and examined to the same Matter; and informed the House, "That this Distinction was not known till lately, since the Contest at Law between the Shoemakers and Curriers began." He was cross-examined in relation to the Tanning of small Pieces; how the Shoemakers are supplied with Leather, and what the Charge of cutting comes to. Also Daniel Henderlay, another Tanner, chiefly of Sole Leather, was examined upon Oath, touching the same Matter, and as to the Price of cutting of Leather; and cross-examined as to whom Tanned Leather is mostly sold. Likewise William Howse, an Officer appointed by the City of London as a Searcher with respect to the Leather Trade, was examined upon Oath, as to the First Matter; and declared, "He never found any Distinction between Tanned Leather and Red Tanned Leather, till the late Law Suits began." He owned, "He was a Currier, but not a Leather-cutter." He was cross-examined, concerning the Places for buying of Leather, whether at Market or elsewhere preferable; and with what Distinctions Leather is entered. Then John Kemp, a Shoe-maker and Clog-maker for Fifty-four Years past, was examined in the same Manner, on the like Subject, and cross-examined in relation to the buying of Leather; and declared, "Cutting had been used during his whole Time." Next, Thomas Rawlinson, a Shoe-maker, was examined in like Manner, as to the buying Leather; and acquainted the House, "That he used to buy of the Tanner, but now of the Leather-cutter; and mentioned the Cost and Profit of Leather, and the Inconvenience of buying whole Hides tanned." Also Samuel Jones, a Cordwainer or Mender of Shoes, a Freeman of the Company, was produced, sworn, and examined; and mentioned the great Conveniency of buying Leather of the Cutter the cheapest Way of Dealing, and that without it he could not carry on his Business. Edward Watson was next produced, sworn, and examined, having been a Leather Clog-maker for above Thirty Years: And acquainted the House with the Conveniency he found in going to the Leather-cutter; and mentioned a Circumstance of his having but Half a Crown to begin with; and though he has had Twelve Children, yet has been able to maintain them; and that without this Conveniency, his Children must have come to the Parish; and that there are not less than Twenty Thousand that reap the Advantage of it. Then Edward Pennyman, a Sadler, was examined upon Oath, to the same Matter; and mentioned the Service and Usefulness of going to the Cutter for Leather, he not being able to use but Two Thirds of a Hide; and if he was obliged to buy whole ones, he could not maintain his Family. Woodward, a Carbine Bucket-maker, was examined also to that Matter, and commended the Conveniency of dealing with the Leather-cutter; he produced a Piece of Leather, which cost him Seven Pence Half-penny, and explained the Use of it; and acquainted the House, He sells a Bucket for Fifteen Pence." Next, William Kendall, a Bridle-maker, was examined upon Oath likewise to the same Matter, and mentioned the great Usefulness of the Leather-cutter. Also James Hudson, a Bellows-maker, was examined in the same Manner, on the like Subject; and acquainted the House, "That he could not make Use of the whole Hide, therefore buys of the Currier; and that his Father did so before him." Likewise Robert Tyrrell, a Currier of Twenty-eight Years standing, was sworn, and examined in relation to the Profits of his Business; and owns he gets Seven or Eight per Cent. by it; and insisted that his Livelihood depended on cutting of Leather. And then John Humphreys, a Journeyman Currier, was examined also, in the same Manner, as to the cutting of Leather, and the Profit thereof; how much he could cut in a Day, and his Wages. Then the Counsel acquainted the House, "That there had been Variety of Verdicts given at Law, between the Curriers and Shoe-makers." And the same was admitted. Notwithstanding which, Samuel Saville and Thomas Goman, were both produced, and sworn, and delivered in Records of Verdicts at Law, in certain Causes relating to Leather. And it being mentioned, "That there were a great Number of Actions depending, and that the Declarations and Issues cost Four Pounds a-piece:"
It was admitted, there were Fourteen Actions depending. Then Thomas Potter, a Shoe-maker, being produced and sworn, was examined as to the Conveniency of going to the Leather-cutter, and the Inconvenience that would otherwise attend them: And acquainted the House, "That there were Twenty Thousand that could not carry on their Business without it; but he believed there were One Hundred that could; and mentioned the Advantage they would reap by the Prohibition of Cutting." He produced a Pair of Pumps, of his own making, which he could sell for Six Shillings; mentioned the great Conveniency the buying cut Leather was to him in making of Boots, and the Price they could be afforded at. He was cross-examined, in relation to the buying of Leather in great Quantities; and declared, "He never could make Use of a whole Hide." Mr. Hamilton and Mr. Clark were severally heard, by Way of Reply. Ordered, That the Bill be committed to a Committee of the whole House, To-morrow. Whereas this Day is appointed, for the House to be in a Committee upon the Bill, intituled, "An Act for the more effectual suppressing of Rogues, Vagabonds, and other idle and disorderly Persons:"
It is Ordered, That the House be put into a Committee thereupon To-morrow; the Lords to be summoned, and the Judges to attend; and that the Cause between Geddes and the Earl of Roseberry and others, appointed for that Day, be put off to Monday next. The House (according to Order) was adjourned during Pleasure, and put into a Committee upon the Bill, intituled, "An Act for the more easy assessing, collecting, and levying, of County Rates." Dominus Cancellarius declaravit præsens Parliamentum continuandum esse usque ad et in diem Veneris, decimum nonum diem instantis Maii, hora undecima Auroræ, Dominis sic decernentibus. Certificate of the E. of Morton's Election. "I do hereby certify, that, by virtue of His Majesty's Proclamation of the Twenty-second Day of March One Thousand Seven Hundred and Thirtyeight, a Certificate under the Hands and Seals of Mr. John Murray and Mr. Thomas Gibson, Clerks of Session attending the Election aftermentioned, in virtue of the Lord Register's Commission to them granted, has been delivered into the Crown-office in Chancery; whereby it appears that James Earl of Morton was unanimously elected to fit and vote in the House of Peers in this present Parliament, in the room of Charles Earl of Selkirk, deceased. "Given under my Hand, this Eighteenth Day of May One Thousand Seven Hundred and Thirty-nine. Powell peremptorily to answer Deer's Appeal. The House being informed, "That Rees Powell Gentleman had not put in his Answer to the Appeal of Mathew Deere Gentleman, though duly served with the Order of this House for that Purpose:"
Ordered, That the said Rees Powell do peremptorily put in his Answer to the said Appeal in a Week. Message from H. C. with Bills, and to return the Governors of the Charterhouse Bill. To return the Bill, intituled, "An Act for the Exchange of certain Lands, in the several Parishes of Wroughton and Liddyard Treagooze, in the County of Wilts, between the Governors of the Hospital commonly called The Charter House, and Thomas Bennet, of Salthrop, in the said County of Wilts, Esquire;" and to acquaint this House, that they have agreed to the same, without any Amendment. 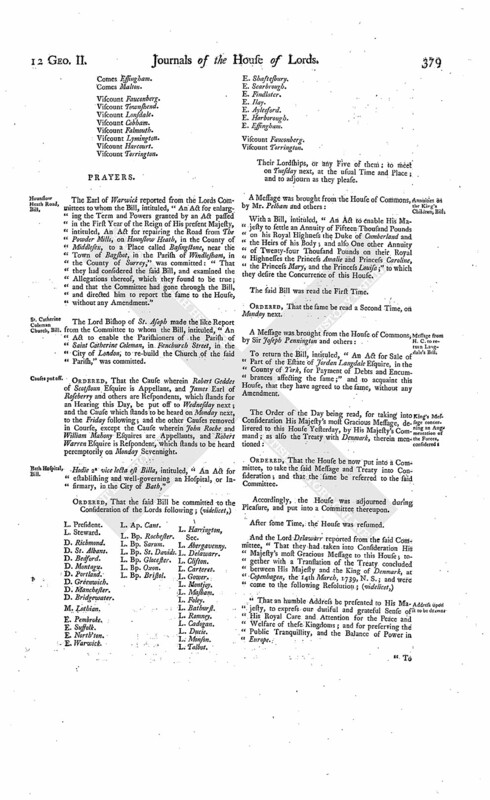 With a Bill, intituled, "An Act for enlarging the Term and Powers granted by an Act passed in the Twelfth Year of the Reign of His late Majesty King George the First, for repairing the Road from Spittlegate Hill, near Grantham, in the County of Lincoln, to Little Drayton, in the County of Nottingham;" to which they desire the Concurrence of this House. With a Bill, intituled, "An Act for repairing the Road, or Highway, form The Dun Cow, in the Town of Dunchurch, through the Parish of Bilton, over Dunsmore Heath, to the Town of Hill-Morton, in the County of Warwick, and from thence, through the several Parishes of Creek, West-Haddon, and East-Haddon, in the County of Northampton, to Saint James's End, in the Parish of Duston, in the said County of Northampton;" to which they desire the Concurrence of this House. Private Lotteries, &c. suppressing, Bill. With a Bill, intituled, "An Act for explaining and making more effectual the several Laws therein mentioned, for suppressing Lotteries denominated Sales, and other Private Lotteries;" to which they desire the Concurrence of this House. 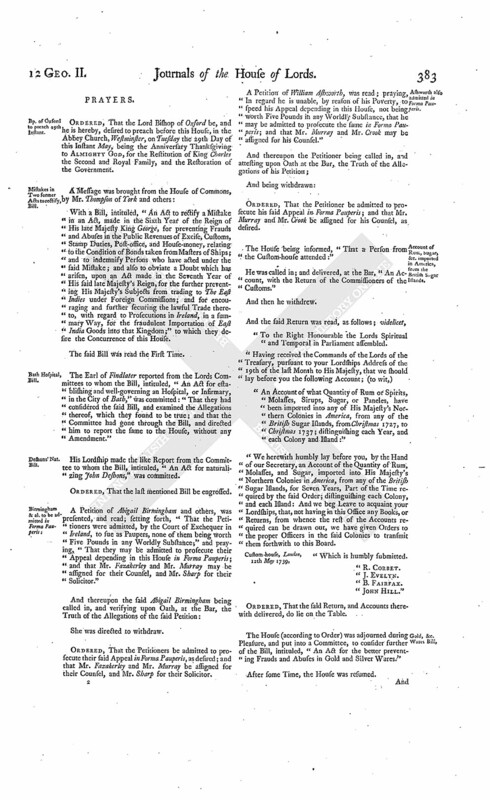 With a Bill, intituled, "An Act for taking off the Duties upon Woollen and Bay Yarn imported from Ireland to England; and for the more effectual preventing the Exportation of Wool from Great Britain, and of Wool and Wool manufactured from Ireland; to Foreign Parts;" to which they desire the Concurrence of this House. The Four last mentioned Bills were all read the First Time; and the Two last severally ordered to be printed. 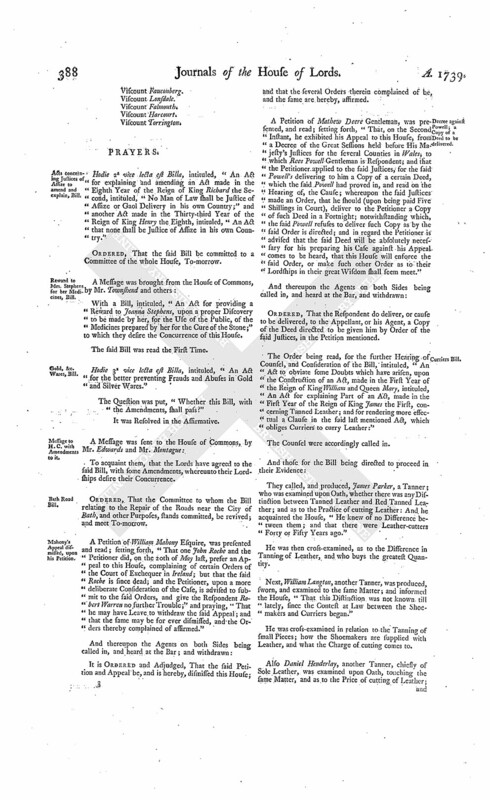 The House (according to Order) was adjourned during Pleasure, and put into a Committee upon the Bill, intituled, "An Act for explaining and amending an Act made in the Eighth Year of the Reign of King Richard the Second, intituled, "No Man of Law shall be Justice of Assize or Gaol Delivery in his own Country;" and another Act, made in the Thirty-third Year of King Henry the Eighth, intituled, "An Act that none shall be Justice of Assize in his own Country, &c."
Mistakes in Two Acts, to rectify, Bill. 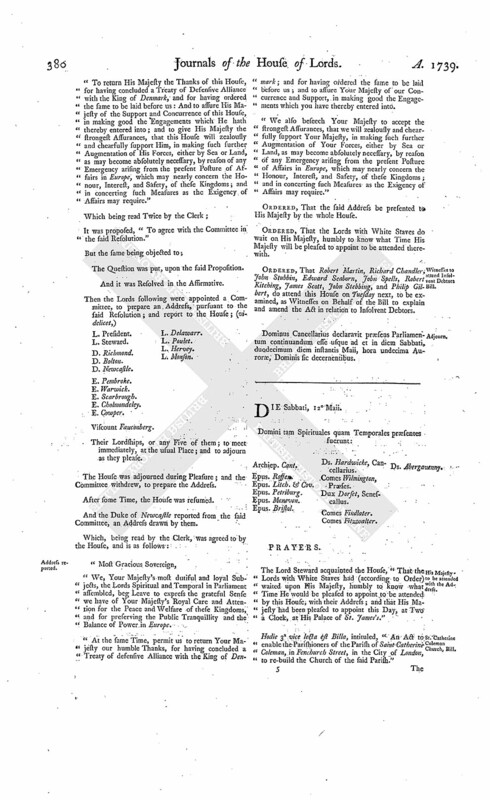 The House also (according to Order) was adjourned during Pleasure, and put into a Committee upon the Bill, intituled, "An Act to rectify a Mistake in an Act made in the Sixth Year of the Reign of His late Majesty King George, for preventing Frauds and Abuses in the Public Revenues of Excise, Customs, Stamp Duties, Post-office, and House-money, relating to the Condition of Bonds taken from Masters of Ships; and to indemnify Persons who have acted under the said Mistake; and also to obviate a Doubt which has arisen upon an Act made in the Seventh Year of His said late Majesty's Reign, for the further preventing His Majesty's Subjects from trading to The East Indies under Foreign Commissions; and for encouraging and further securing the lawful Trade thereto, with regard to Prosecutions in Ireland in a summary Way, for the fraudulent Importation of East India Goods into that Kingdom." And the same Earl made the like Report as on the former Bill. Hodie 3a vice lecta est Billa, intituled, "An Act for the more easy assessing, collecting, and levying, of County Rates." Ordered, That the House be put into a Committee upon the said Bill on Thursday next; the Lords to be summoned; and the Judges then again to attend. 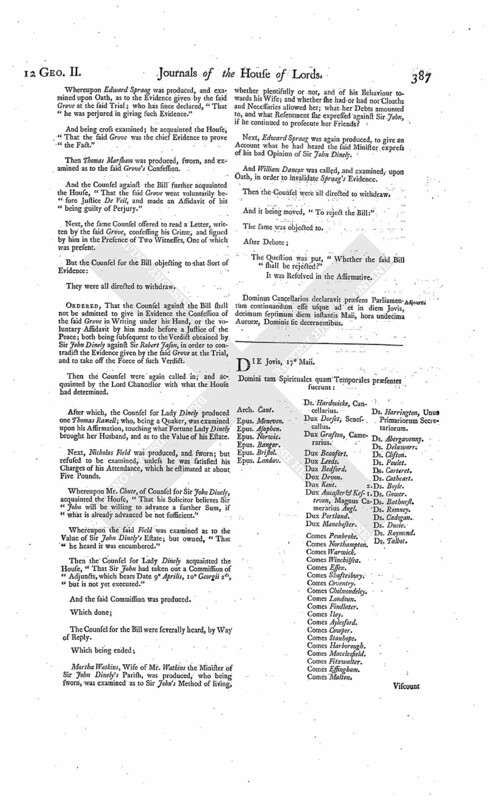 The House (according to Order) was adjourned during Pleasure, and put into a Committee upon the Bill, intituled, "An Act to obviate some Doubts which have arisen, upon the Construction of an Act made in the First Year of the Reign of King William and Queen Mary, intituled, "An Act for explaining Part of an Act made in the First Year of the Reign of King James the First, concerning Tanned Leather;" and for rendering more effectual a Clause in the said last mentioned Act, which obliges Curriers to curry Leather." Dominus Cancellarius declaravit præsens Parliamentum continuandum esse usque ad et in diem Lunæ, vicesimum primum diem instantis Maii, hora undecima Auroræ, Dominis sic decernentibus.